Sandy Straits and Beyond: Quintessentially Australian! I couldn't finish my posts about my trip out to SW Queensland without including photos of the most easily recognized of all the birds and animals from the less closely settled regions of Australia! These photos were also taken on Kilcowera Station. We saw numbers of emus as we traveled around the station. This photo was taken soon after we left the camp ground. The next morning I found big bird prints just outside the fence around the camp ground. 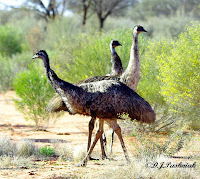 Later in the day when we stopped to eat our lunch a group of emus came close to check us out. They circled right around us to have a good look from all angles then slowly walked off again. 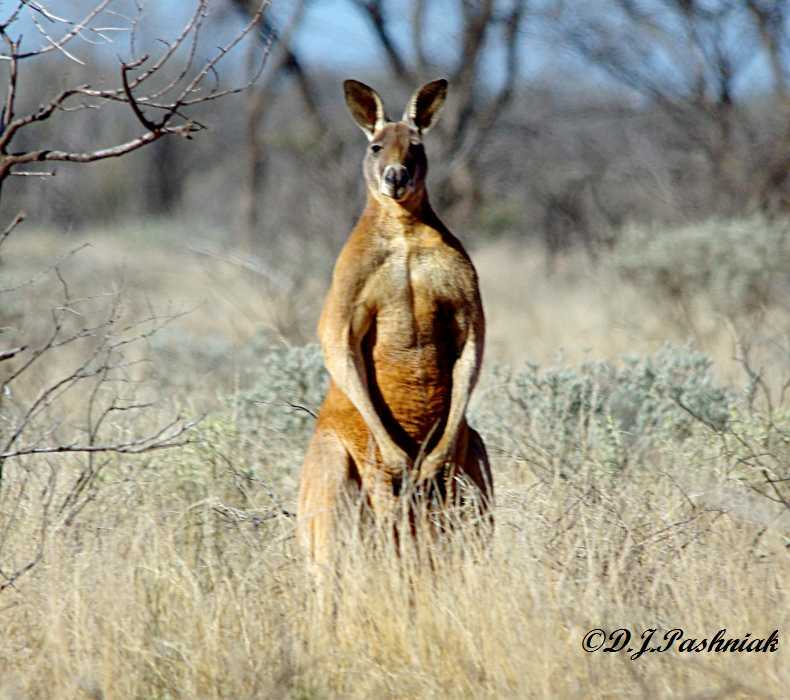 This kangaroo is a big male of the Red Kangaroo species. 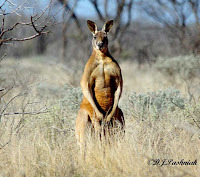 They are the biggest of all the kangaroos and can grow up to 2 meters in height. For more bird photos visit the Bird Photography Weekly. Great photos of the Emu's by any chance did you come across any Bustard in your travels. Hi Neil, that's one I missed, unfortunately. Emus may have been hoping for some crusts. Hi Tony, Which they certainly didn't get! Emus look a bit like dinosaurs too...how about their tracks? Fascinating! Love that kangaroo photo too. Wow, that's a complete turnaround! 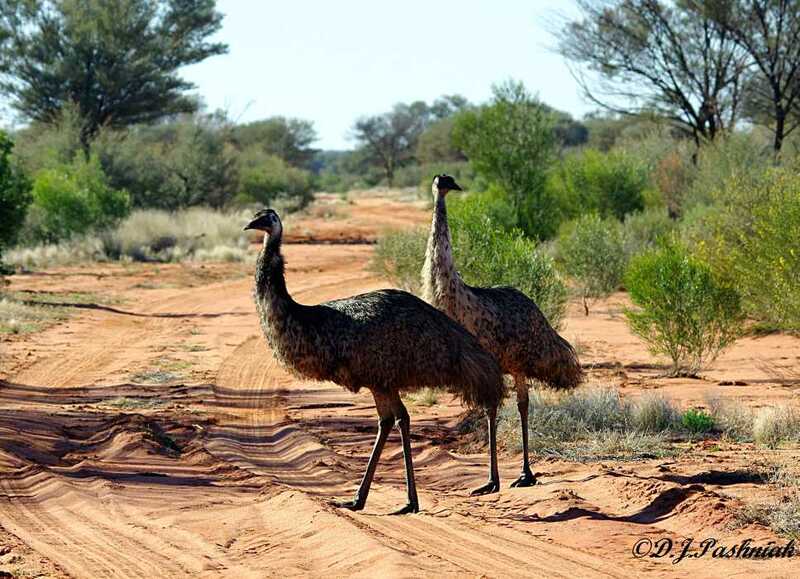 Instead of you looking for Emus, they came looking for you! Great shot! Big country big animals Mick. That kangaroo looks a bit scary but I guess they are more frightened of humans? It seems strange over here that such a large bird as the Emu can be totally wild. Hi Bob, it was great to see them in habitat like that and to find them so inquisitive. Hi Phil, There's a lot of very empty country out there - or at least that's the way it looks to me! Yes, usually the kangaroos take off pretty quickly when there are people around but just on principal I wouldn't mess with a male that big! I can only imagine (again) how awesome it must be to see these in the Wild. Hi Nicole, I thought it was really great too.